Okay, the bugs have been worked out and we’re ready to start! First, I made you a coloring sheet that has color placements noted with red letters. You can download a PDF by clicking on the image. 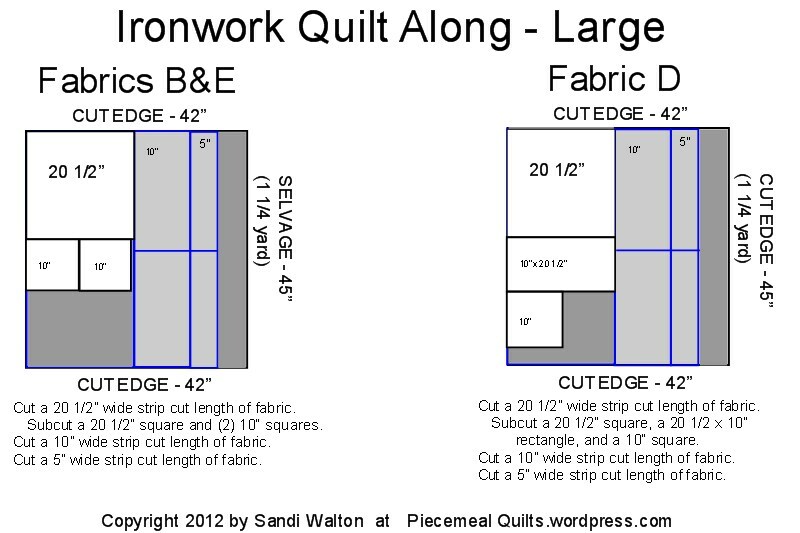 Because of the size of some of these pieces, especially in the large quilt, you need to be careful about how you cut things. I laid out the cutting placement for you, and you can either view these photos (click to see them larger) or download a PDF of the cutting instructions. 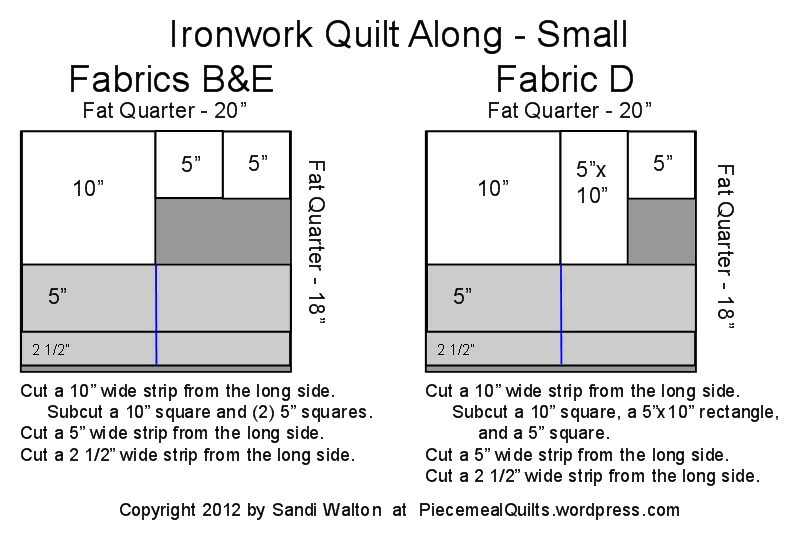 Important: For the larger quilt, the strips are cut the length of the fabric, not the width. They will run from cut edge to cut edge, NOT selvage to selvage! Make sure you have at least 42″ of useable fabric after squaring it up. This will give you the most efficient use of your fabric, and will give you a little wiggle room when sewing the blocks. That extra inch or three makes a big difference. If you have wider fabric (useable fabric from selvage to selvage is MORE THAN 42″), you can cut selvage to selvage if you like. 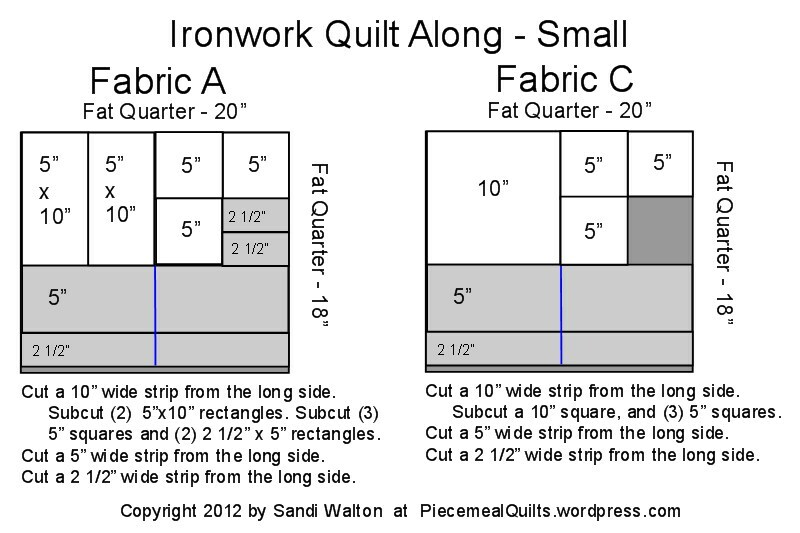 For the smaller quilt, watch placement on the long side vs. the short side of your fat quarter! You’ll notice that some of the pieces on the diagrams are in white and some are in grey. The white pieces are used as is – no additional cutting/piecing. The grey pieces will be used to assemble the Ironwork* blocks. I suggest cutting all of your pieces then setting aside the white diagrammed ones so you don’t get them mixed up with the ones you need to work with. 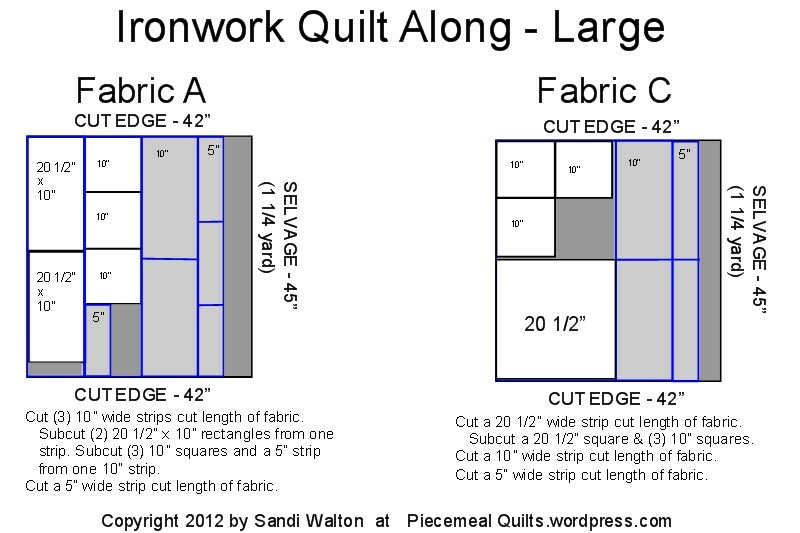 Once your fabrics are all cut and organized, we’ll get started on the Ironwork* blocks! Please let me know if you have any questions, or if you find an error! It looks great! Thanks for such detail on the cutting. I’ve printed out my “working” papers, ha. For the strips, when you say the small one needs 26 strips 1″ wide, you mean a strip is equal to one WOF cut, right? And then that will be sub-cut at some point into the various sizes? It may be a few days before I get around to cutting (probably the weekend), but I’m looking forward to it. Yes, the “iron” strips are cut width of fabric. I don’t subcut these, I chain piece onto them. They’re cut after sewing. I am so excited about this QAL!! I have never joined into one before but couldnt resist this one. The reason I got into quilting was because I wanted to make roman shades for my living room and I decided to make them into a stained glass form. Using fabric to make it look like I was looking through a window with a landscaped scene behind it. Quite an ambitious project for a person who had yet to ever touch a sewing machine. To do this project I first had to learn to piece. Enter quilting! I have yet to get that project done but still have every intention of doing it. I just need to hone my sewing skills a bit more first. Well now I have a frame and a mid arm and making many projects and LOVE LOVE LOVE every minute of it. I am disabled and took so much pride in my work as well as my success in my field. Losing that was a huge blow to my self worth. I feel I have regained what I lost and found a creative side of me I never knew I had. I have people like you to thank for this since I have learned everything I have by reading blogs, tutorials and watching youtube video tutorials. 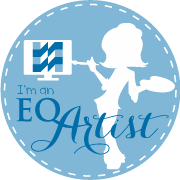 I have even built my own blog to pass along everything I learn and have learned to others like me trying to lean this awesome craft. I feel it is the least I could do. 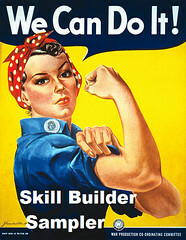 Your project is right up my alley and I cannot wait to get going on it! Again, thank you so much for taking the time to do this. I am so excited to quilt along with you too! 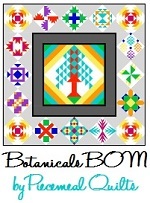 this is the first QAL I’ve ever done, but I’ve been searching for a stained glass pattern that I loved. This one sang out to me, it’s stunning, and I can hardly wait to try it. I bought Marblehead fabric in blues and golds and plan to make it for my husband for our 35th wedding anniversary present (blue and gold are his college colors- the University of California at Berkeley). got it all cut out today and am ready to sew! thanks so much for doing this!